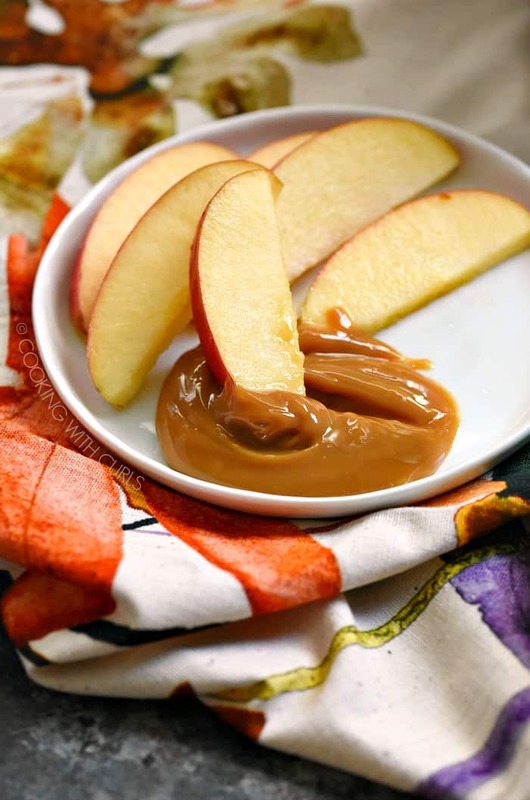 Have you ever wanted a really thick, creamy caramel to dip your apple slices into that isn’t loaded with strange ingredients? Or maybe you have been dying to make a caramel cheesecake, or alfajores (caramel filled shortbread cookies) for the holidays? 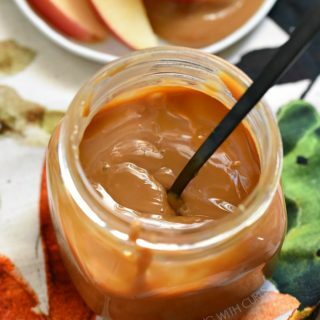 Well now you can with this super easy to make Instant Pot Dulce de Leche…..
All you need is a can of sweetened condensed milk, a mason jar, and some water…..
to create an amazingly delicious treat…..
Open a can of sweetened condensed milk and pour it into a mason jar…..
Place the lid on the jar and twist to seal. 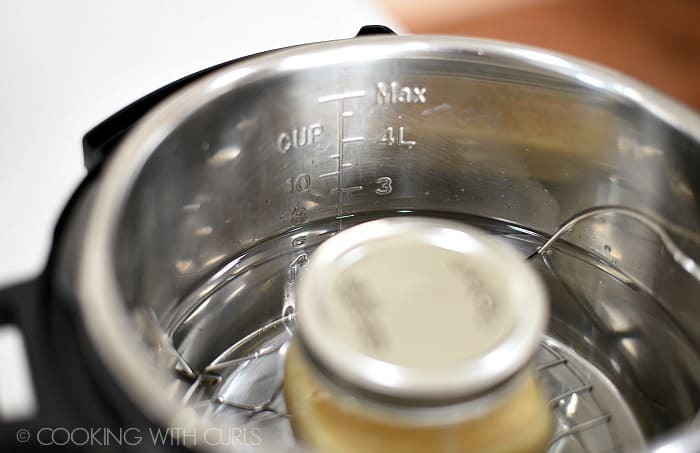 Set the jar on a trivet inside the pressure cooker and add enough water to the pot to cover the jar halfway….. Secure the lid and turn the pressure knob to the “Sealing” position. Press the “Manual” button and adjust the time to 30 minutes using the + and – buttons….. When the pot beeps, allow the pressure to release naturally (mine took 45 minutes). Remove the lid…..
and VERY CAREFULLY remove the jar from the pressure cooker. Allow the caramel to cool….. 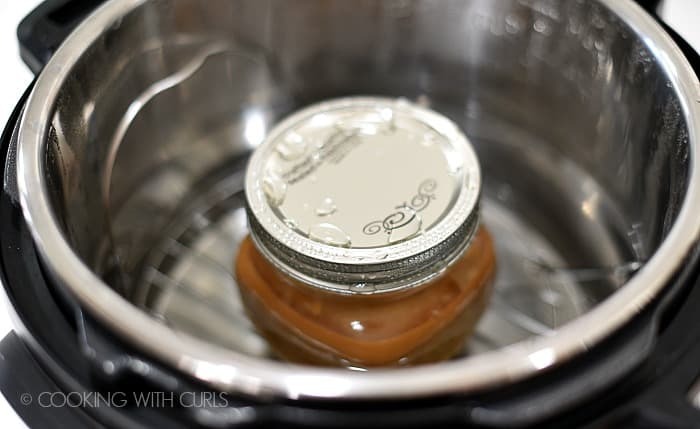 The caramel is still bubbling in the jar and the lid will not come off until it cools down enough to break the seal! 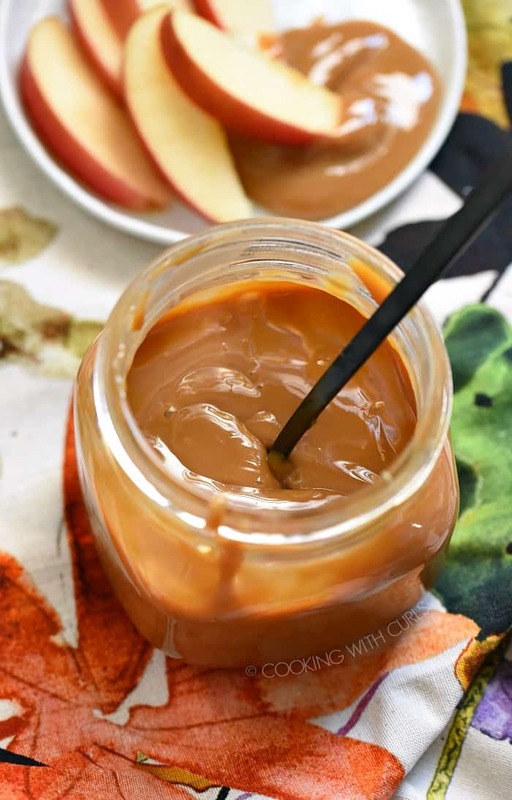 Stir the caramel with a spoon until smooth….. This Instant Pot Dulce de Leche is addictive!!! Can’t I put a can of sweetened condensed milk in a pressure cooker to cook? Why do I need to use a jar? What if I want to make Salted Caramel? Sprinkle Kosher or sea salt over the caramel right before serving. 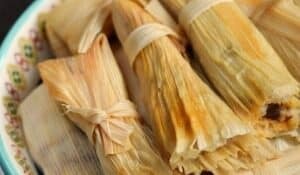 What else can I serve Instant Pot Dulce de Leche with? 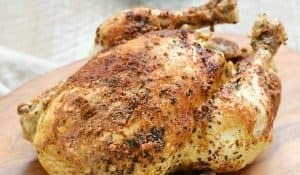 I used a 16-ounce, wide-mouth mason jar to create this recipe. 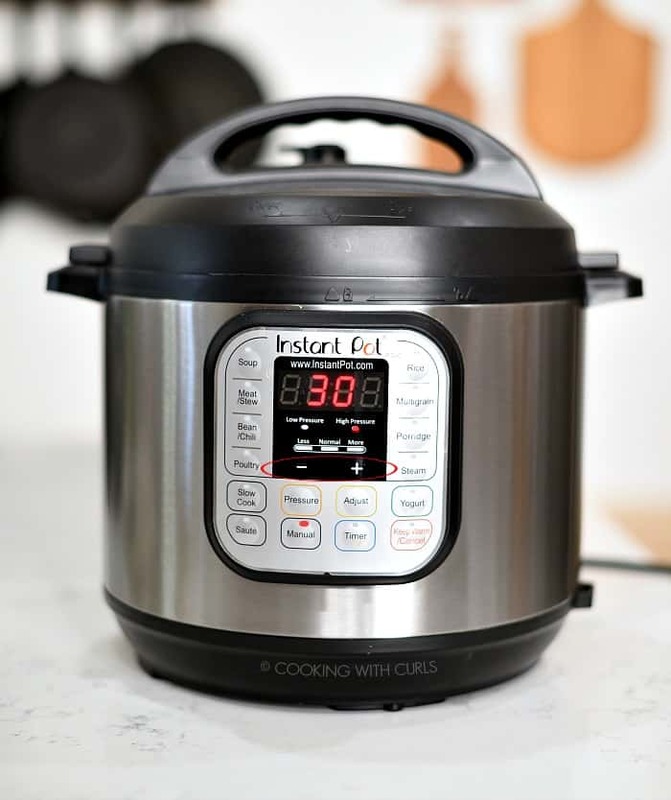 All of my Instant Pot recipes are made using one of these 6-quart models. 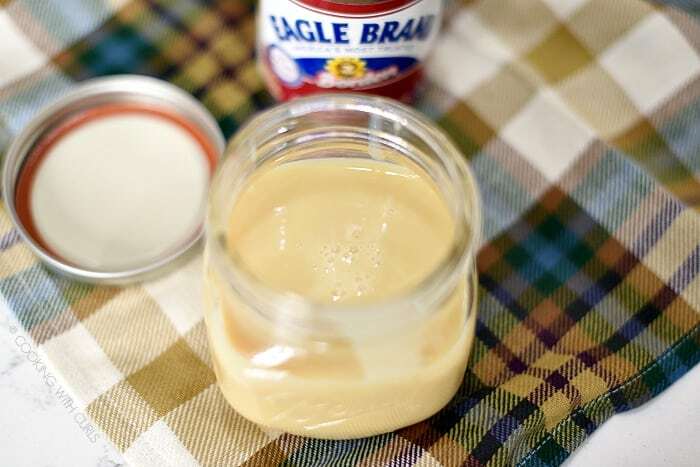 The Eagle Brand sweetened condensed milk that I used contains milk and sugar, that’s it. 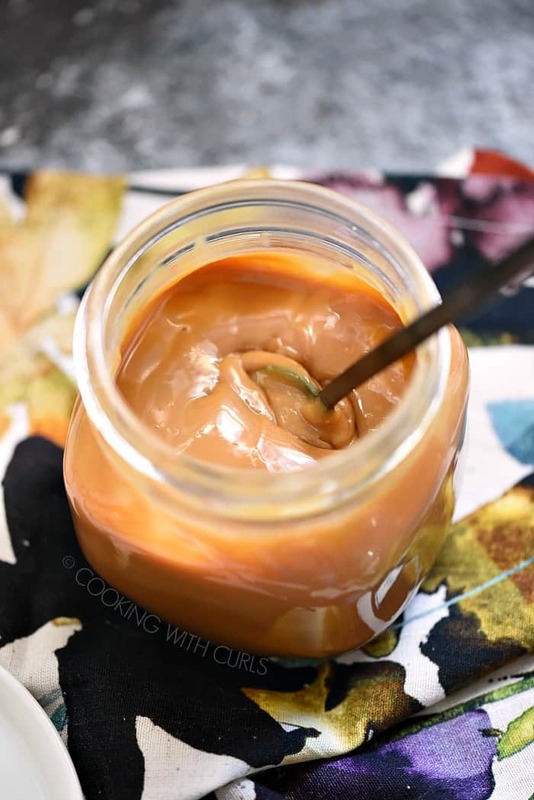 My plan is to use this Instant Pot Dulce de Leche to create some Turtle Thumbprint Cookies. What will you use it for? 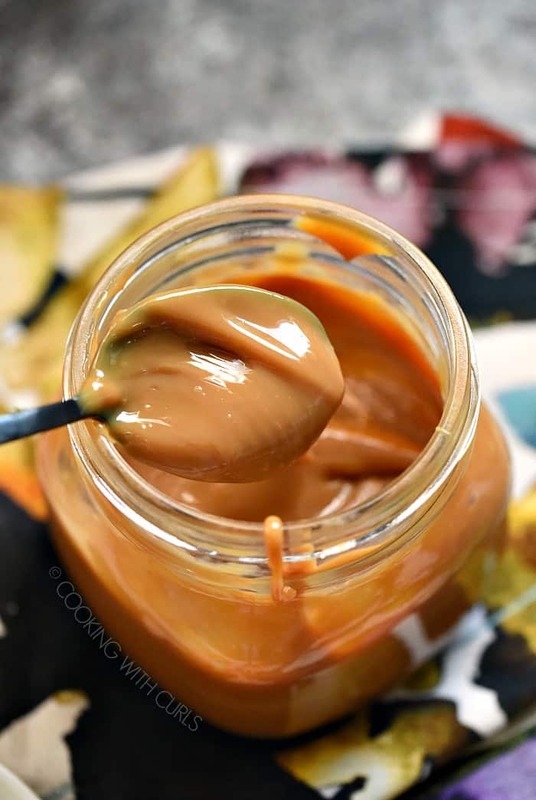 How to make Instant Pot Dulce de Leche in a pressure cooker using a can of sweetened condensed milk from the grocery store! 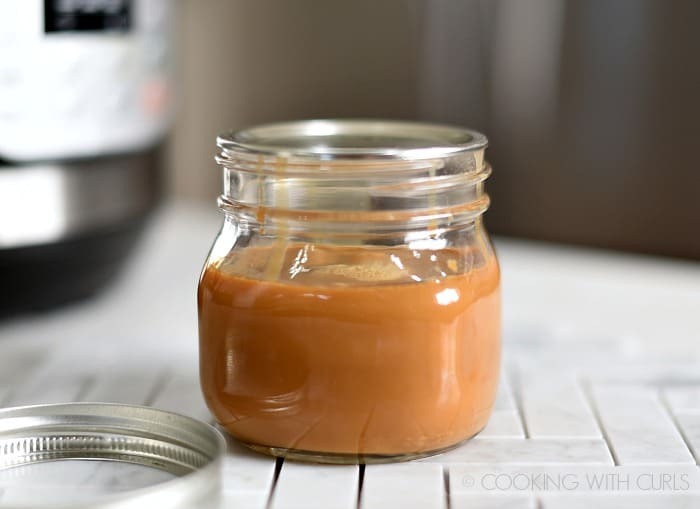 Open a can of sweetened condensed milk and pour it into a mason jar. Place the lid on the jar and twist to seal. Set the jar on a trivet inside the pressure cooker and add enough water to the pot to cover the jar halfway. Secure the lid and turn the pressure knob to the “Sealing” position. Press the “Manual” button and adjust the time to 30 minutes using the + and – buttons. Stir the caramel with a spoon until smooth and serve. Serving size is based on 2 Tablespoons per serving with a total of 10 servings per can. The time it takes for the pressure cooker to build pressure is not included in the cooking time. Times vary based on content temperature, water temperature, elevation, etc. 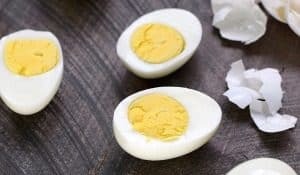 I really want to try this recipe, but I am nervous I will put the lid on too tight and have an explosion! 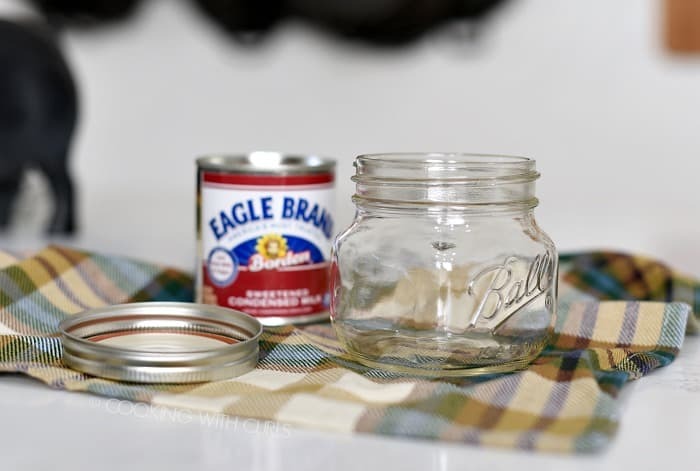 Do I have to use the lid, or can I use tin foil to cover the jar? Honestly I don’t think you can manually put the lid on too tight, Cilka. I have never tried to make it with foil instead of a lid but it is worth a try if it gives you peace of mind. 🙂 Let me know how it turns out!